Loco is a Renegade. Choo-choo! Loco and Vain Train spied on the Robo Rebels at a dude ranch in Utah, accidentally learning about the legendary Fountain of Youth on the grounds. Loco pumped the fountain dry to test its waters, and discovered the secret of its temporal powers. He formulated an anti-chroniton agglutination that prevented any aging or changing to his super-structure, preserving it eternally and therefore making him practically invulnerable. 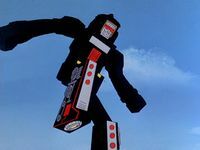 A straight import of the Machine Robo Steam Robo toy, GoBots Loco converts from robot to JNR D-5 steam locomotive engine. He was one of the original batch of Machine Robo figures designed by Popy prior to Bandai taking over the line. The fifth toy from the original six figure wave, Train Man was released by Bandai Australia during the second quarter of 1983. He remained identical to the original Steam Robo toy, albeit packaged on a blue backing card. In 1984, the figure was re-released with his GoBots name and faction on a new black backing card depicting a blue-tinted alien landscape. 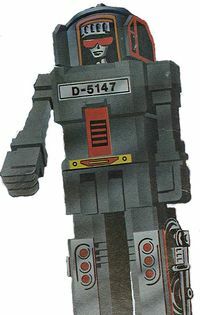 A carded repackage of Steam Robo featuring a new starfield-style background, Train was released by Bandai Europe during the latter half of 1983. The figure was later re-released as part of the second wave on a blue backing card. 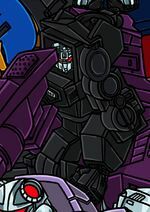 Loco's Cybertronian-style body from the "Cataclysm universe" is modeled on Return of Convoy D-Go. This page was last edited on 21 September 2018, at 02:55.